Mansfield, TEXAS — Stop by Pulsar’s SHOT Show booth #11924 to learn about their top-of-the-line products! SHOT Show 2019 is scheduled for January 22 – 25 at the Sands Expo Center in Las Vegas, Nevada. 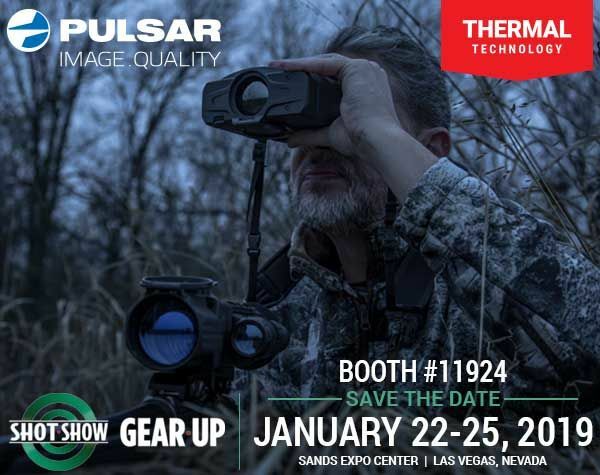 Check out the latest Pulsar product releases including the Trail LRF Thermal Riflescopes, Accolade Thermal Binoculars and learn about new products for 2019. Earn some exclusive swag like hats and tactical pens through the recoil simulated air gun challenge. New for 2019, the Pulsar Thermion riflescope brings true superiority to the thermal game. Thermions will feature a true HD AMOLED display to allow the user to see the night world in pristine clarity with a detection range of up to 1800 meters. Show your peers your best moments with onboard recording with up to 16GB of storage. Thermions are also compatible with the Stream Vision App allowing you to transfer all your content into digital memory. Designed for a variety of applications, the Accolade Thermal Binoculars offer a dual eyepiece configuration for comfort and reduced eye fatigue. Accolades offer a 384x288 (XQ models) or 640x480 (XP models) sensor with 50hz refresh rate and feature a long detection range between 1350 and 1800 meters. XQ and XP models are also available with an integrated laser rangefinder (LRF). Accolades will satisfy the needs of beginners and professionals who give priority to supreme quality and ultimate performance.